While going through our testing of our new coded scenarios, we noticed that one Instructor Station (IS) computer displayed the events differently when we compared it to another of our LLEAP computers. 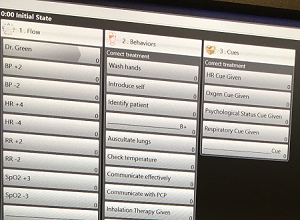 The IS in our Pediatrics control room showed only one category expanded; the others were minimized as in Figure 1. On the other hand, our Medical/Surgical IS presented the categories across the screen shown in Figure 2. The single column presentation forces the operator to expand the specific menu to access the needed event. And expanding one menu minimized the other so we were constantly clicking on category headers to get to the event we wanted to invoke. We really wanted the expanded event display we had in Med/Surg. We looked through the various menus and help files and could find nothing that indicated a way to change the Event category display. 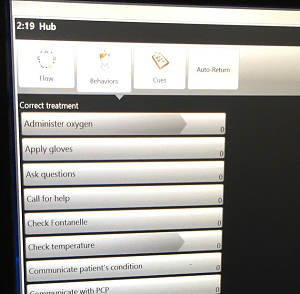 At that point, we reached out to Laerdal Tech Support. After a few emails back and forth, the technician assigned to the request, Edward Carter, took a long look at the issue and discovered that there WAS NO setting for this; the scenario code itself was determining how the events would be displayed. He dug into it further and discovered a flag inside the code that was determining how the display would look. While he couldn’t be certain, Edward though it might be an artifact of how the scenario came into being in the first place. He asked if either of the two sample scenarios we sent him were originally converted from the old Legacy format. The Med/Surg bay was the first one upgraded and that was probably the one where we converted all the scenarios to see how good the converter worked. And since we knew we had coded the Pediatrics scenarios from scratch to apply Hub programming, it made sense that we would see the single column presentation on that IS. Thus, Edward’s idea had some validity and we proceeded to test his theory. Step 7 can be explained as zipping the files IN the parent folder, not zipping the entire folder. To do this, open the folder, select all the files in the folder and zip them to a new location. If you do zip the entire folder, when you open the scenario in LLEAP your result looks like a newly defined, empty scenario with everything set at the default. Changing that flag inside the XML did the trick. Thanks to Edward Carter’s research on the problem, now all our production scenario programs present the Events window with all event categories expanded. We no longer have to click to open event categories while running the scenario.